The union features a top layer of gel infused, soft Visco memory foam with an extra later covering the pelvic loading area. 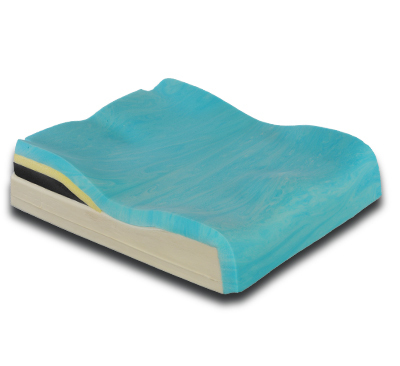 The gel infused memory foam has a cooling effect as there is increased airflow thru the surface and the gel absorbs heat. This material combination creates the ultimate sitting surface: distributes weight for pressure reduction and provides maximum comfort. The Union’s foam base is moderately contoured to encourage proper positioning of the pelvis and thighs. Added 1″ lateral pelvic wedges offer superior lateral stability and alignment of the pelvis for more involved positioning needs. Choose the reduced profile option to lower the union’s overall height by 1” to maintain lower seat to floor height. 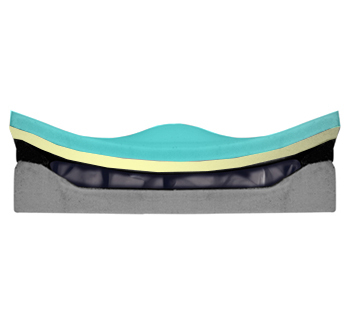 The JAY Flow fluid insert that lies beneath the Visco™ foam conforms to each individual’s unique contours for even pressure distribution beneath the pelvis and a reduced risk of skin breakdown. 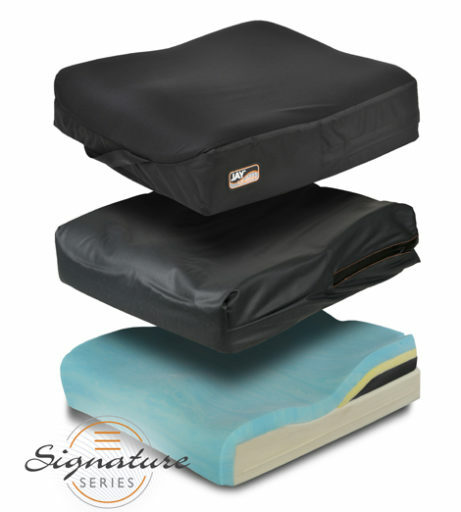 This cushion offers great pressure relief with no maintenance. Height Front: Standard profile - 4.5", Reduced Profile - 3.5"